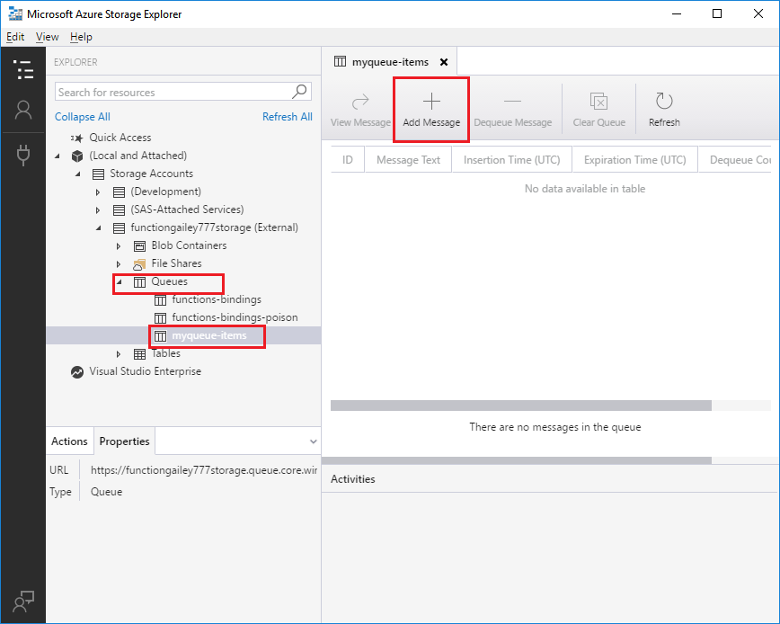 Learn how to create a function that is triggered when messages are submitted to an Azure Storage queue. An Azure subscription. If you don't have one, create a free account before you begin. Select the Create a resource button found on the upper left-hand corner of the Azure portal, then select Compute > Function App. Use the function app settings as specified in the table below the image. App name Globally unique name Name that identifies your new function app. Valid characters are a-z, 0-9, and -. Subscription Your subscription The subscription under which this new function app is created. Resource Group myResourceGroup Name for the new resource group in which to create your function app. OS Windows Serverless hosting on Linux is currently in preview. For more information, see this considerations article. Hosting plan Consumption plan Hosting plan that defines how resources are allocated to your function app. In the default Consumption Plan, resources are added dynamically as required by your functions. In this serverless hosting, you only pay for the time your functions run. When you run in an App Service plan, you must manage the scaling of your function app. Location West Europe Choose a region near you or near other services your functions access. Runtime stack Preferred language Choose a runtime that supports your favorite function programming language. Choose .NET for C# and F# functions. Storage Globally unique name Create a storage account used by your function app. Storage account names must be between 3 and 24 characters in length and may contain numbers and lowercase letters only. You can also use an existing account, which must meets the storage account requirements. Application Insights Default Creates an Application Insights resource of the same App name in the nearest supported region. 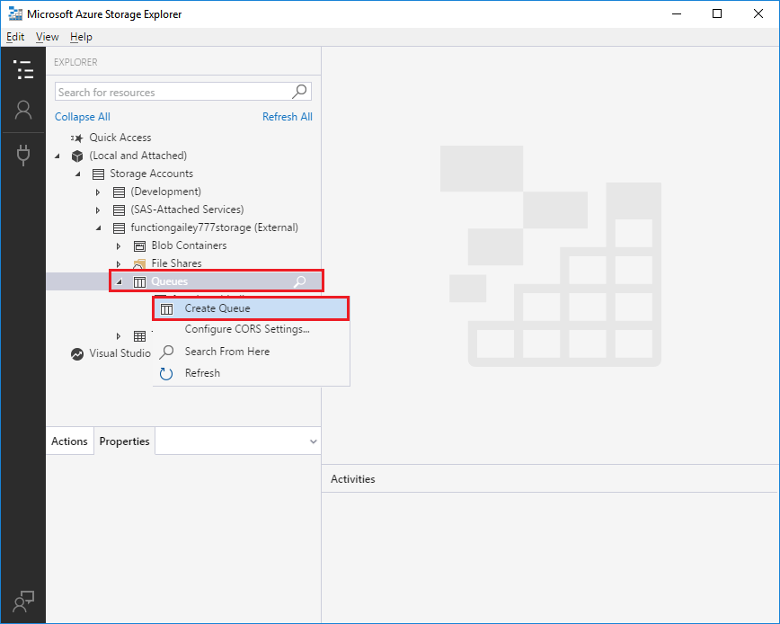 By expanding this setting, you can change the New resource name or choose a different Location in an Azure geography where you want to store your data. Select the Notification icon in the upper-right corner of the portal and watch for the Deployment succeeded message. Select Go to resource to view your new function app. 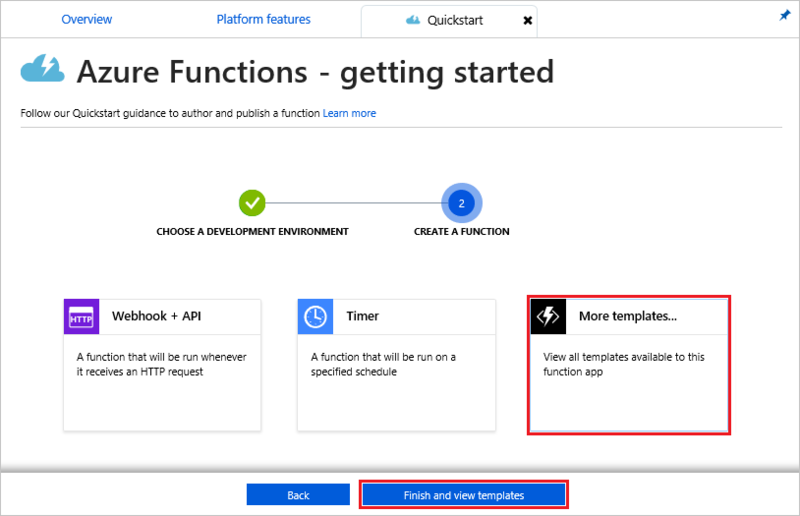 Having trouble finding your function apps in the portal, try adding Function Apps to your favorites in the Azure portal. Next, you create a function in the new function app. Expand your function app and click the + button next to Functions. If this is the first function in your function app, select In-portal then Continue. Otherwise, go to step three. Choose More templates then Finish and view templates. In the search field, type queue and then choose the Queue trigger template. If prompted, select Install to install the Azure Storage extension any dependencies in the function app. After installation succeeds, select Continue. Use the settings as specified in the table below the image. Name Unique in your function app Name of this queue triggered function. Queue name myqueue-items Name of the queue to connect to in your Storage account. 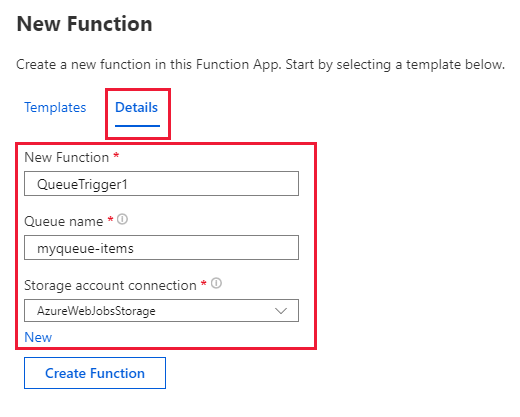 Storage account connection AzureWebJobStorage You can use the storage account connection already being used by your function app, or create a new one. Click Create to create your function. 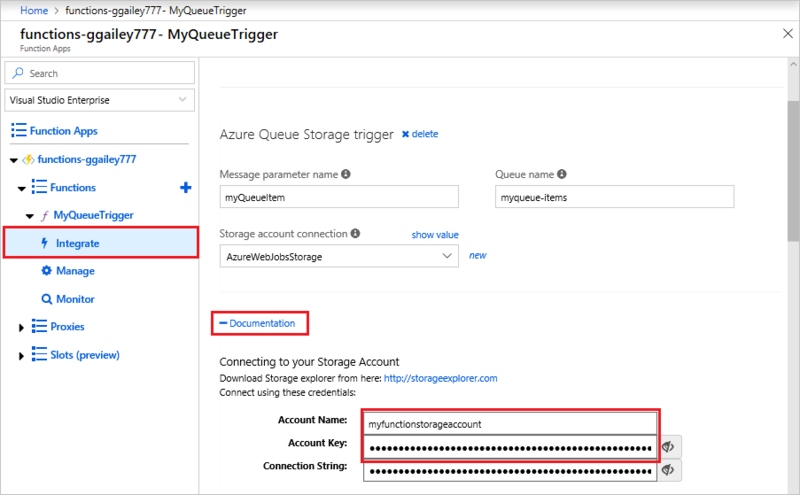 Next, you connect to your Azure Storage account and create the myqueue-items storage queue. In your function, click Integrate, expand Documentation, and copy both Account name and Account key. 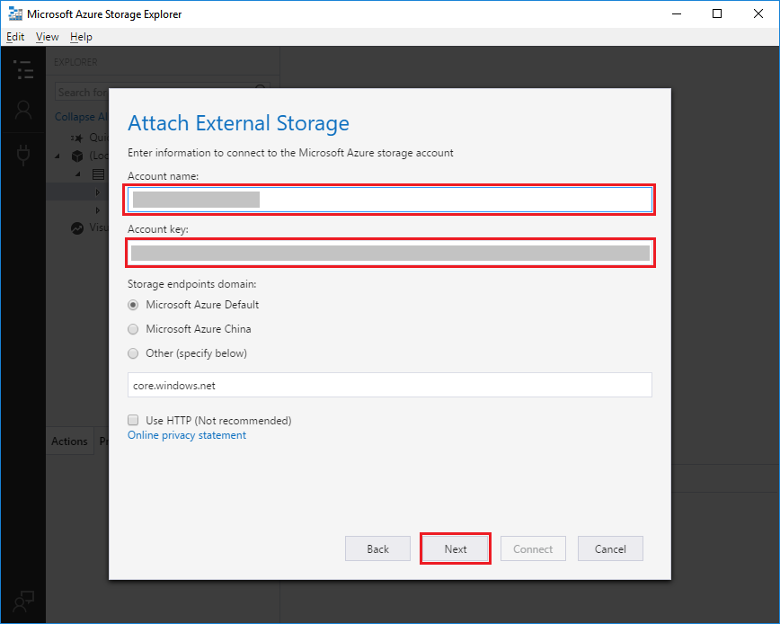 You use these credentials to connect to the storage account in Azure Storage Explorer. If you have already connected your storage account, skip to step 4. 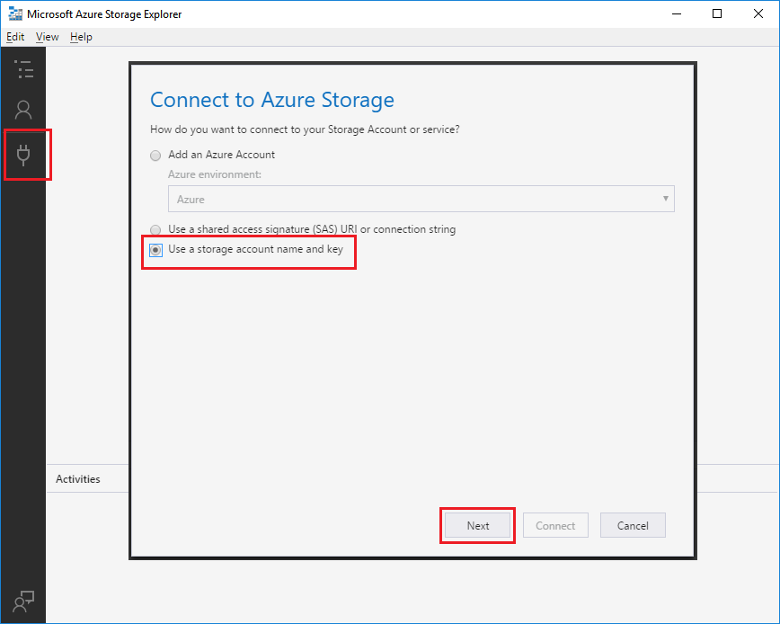 Run the Microsoft Azure Storage Explorer tool, click the connect icon on the left, choose Use a storage account name and key, and click Next. Enter the Account name and Account key from step 1, click Next and then Connect. Expand the attached storage account, right-click Queues, click Create Queue, type myqueue-items, and then press enter. Now that you have a storage queue, you can test the function by adding a message to the queue. 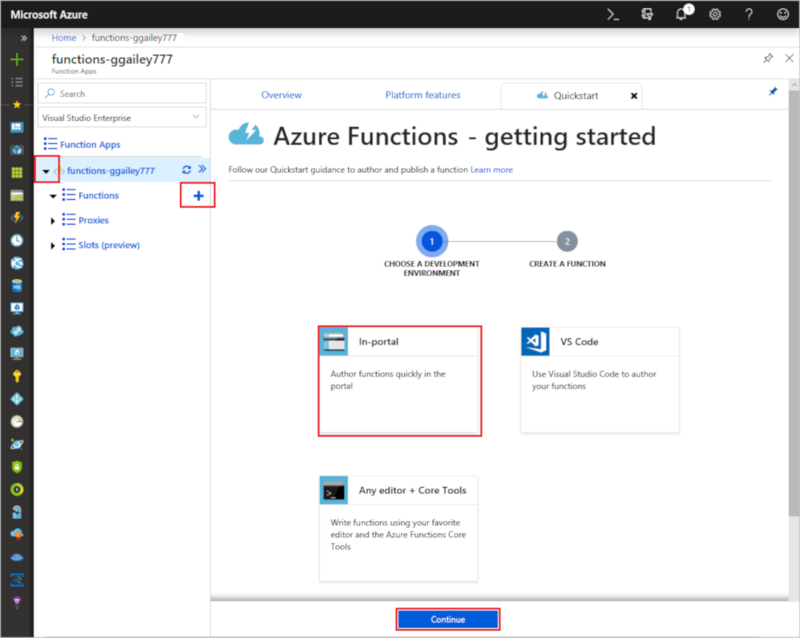 Back in the Azure portal, browse to your function, expand the Logs at the bottom of the page, and make sure that log streaming isn't paused. In Storage Explorer, expand your storage account, Queues, and myqueue-items, then click Add message. Type your "Hello World!" message in Message text and click OK. Wait for a few seconds, then go back to your function logs and verify that the new message has been read from the queue. Back in Storage Explorer, click Refresh and verify that the message has been processed and is no longer in the queue. Other quick starts in this collection build upon this quick start. If you plan to work with subsequent quick starts, tutorials, or with any of the services you have created in this quick start, do not clean up the resources. 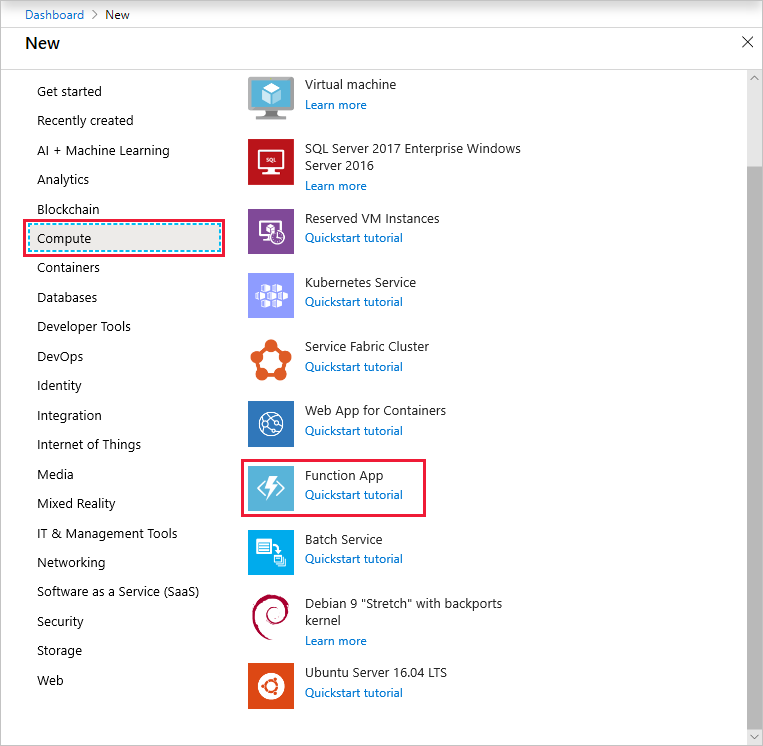 Resources in Azure refers to function apps, functions, storage accounts, and so forth. They are grouped into resource groups, and you can delete everything in a group by deleting the group. 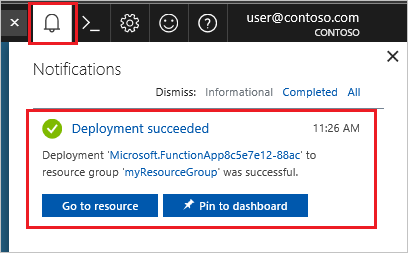 In the Azure portal, go to the Resource group page. To get to that page from the function app page, select the Overview tab and then select the link under Resource group. To get to that page from the dashboard, select Resource groups, and then select the resource group that you used for this quickstart. In the Resource group page, review the list of included resources, and verify that they are the ones you want to delete. Select Delete resource group, and follow the instructions. Deletion may take a couple of minutes. When it's done, a notification appears for a few seconds. You can also select the bell icon at the top of the page to view the notification. You have created a function that runs when a message is added to a storage queue. 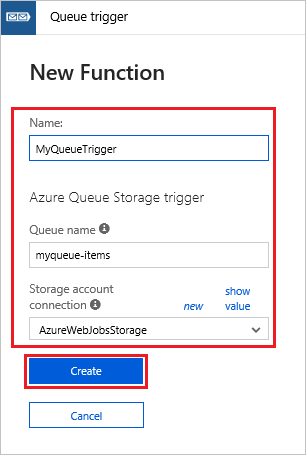 For more information about Queue storage triggers, see Azure Functions Storage queue bindings. Now that you have a created your first function, let's add an output binding to the function that writes a message back to another queue.